It’s no longer just about driving more traffic to your website to increase sales. Smart online marketers are realizing that to really increase sales you need to optimize your visitor’s onsite experience and convert more of them, and not just search engine rankings. This newer technique is called conversion rate optimization (CRO), and many websites are already gaining excellent results from it. Are you ready to take advantage too? This CRO guide will help kickstart your CRO efforts, increasing your website sales or leads without needing more traffic. It contains answers to the most common and important questions about CRO, with helpful related guides to learn more. Let’s get started with some basics. Conversion rate optimization is the art of converting more visitors on your website into your goals (e.g. sales or leads). By increasing your conversion rate, you increase your website sales or leads without actually needing more traffic. What are the benefits of doing CRO for your website? Generates more leads or sales on your website, with the same traffic you already have, which means you don’t have to spend more money on traffic. Helps maximize the return on investment from your marketing spend, and reduces the cost per sale or acquisition. Improves your website so that it engages more visitors, and increases the chances of them returning and converting in the future. What kind of results can I expect from doing CRO? Your conversion rate is the proportion of your website visitors that convert for your main website goal, which is quite often a purchase or a signup. This is easy to setup in tools like Google Analytics. They also track ‘goal conversion rate’ for specific goals like signups or leads. 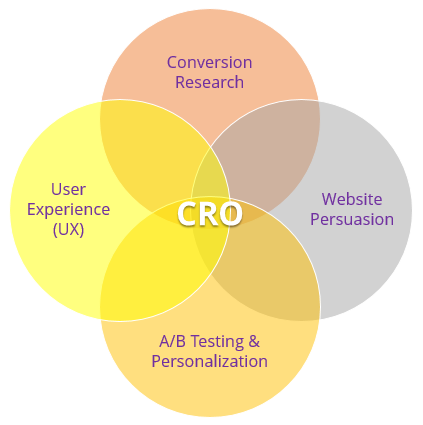 What are the main elements of CRO? CRO is made up of four overlapping main elements – conversion research, user experience (UX), website persuasion, and A/B testing and personalization. Making strong use of these will increase your chances of improving your conversion rates, and therefore your sales or leads. Conversion Research: Gather insights and improvement ideas from conversion research. This comes from web analytics, heat maps, visitor recordings, surveys, user testing and expert CRO reviews. This is the most essential piece of CRO, and cannot be done effectively without it. Website Persuasion: Don’t just hope your website converts your visitors. To engage and convert many more of them, use copywriting best practices and influence techniques, including the usage of social proof, scarcity, urgency and reciprocity. User Experience (UX): Improve your website user experience so visitors can browse and convert more easily, including using best practices for improving your website navigation, forms and user flow. Without it, it doesn’t matter how good your website looks or how persuasive it is. A/B Testing & Personalization: A/B tests and personalization techniques are used to discover and show the highest converting experience for your website. This is very useful, but not essential, particularly because so many websites don’t have enough traffic or conversions for this. 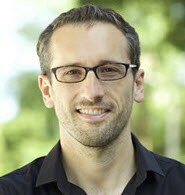 Why is conversion research so important? Don’t just guess at what to improve on your website, or only listen to what your boss wants to improve, as this often fails to get good results on your conversion rates and sales. Conversion research is essential for determining what needs improving and why, and is gathered from visitors and analytics tools. Web analytics. Tools like Google Analytics are not just for reporting on traffic and KPIs. Doing in-depth analysis forms the quantitative part of conversion research, and reveals pages and traffic sources with the highest potential to improve. Visitor recordings. Use these to watch EXACTLY what visitors do on your website. They are great for discovering visitor issues, like page elements or form fields they find hard to use. Always gain insights from these recordings for pages you want to improve. Heat maps. These are a good compliment to visitor recordings. Don’t just presume you know what visitors click on or how far they scroll – check these for your key pages. Great for revealing CTAs, images and content that should be clicked on more. Surveys and polls. The voice of your visitors is THE most important thing in CRO. Essential to find what they like and don’t like with surveys and polls. Create single question polls for specific feedback, and send customer surveys. User testing. Gain feedback from your target audience while they try to complete tasks on your website and ask them questions. Great for discovering what people think of your website, their issues with it, and what needs improving. Expert reviews. This is done by an experienced CRO expert (often called heuristic analysis), and is a fast effective way of getting CRO insights and recommendations. 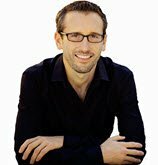 These are offered by CRO experts including myself, CXL and WiderFunnel. Insights from these elements of conversion research then feeds into better ideas for the other elements of CRO, including A/B testing. Conversion research is often neglected or not well understood, apart from web analytics, so you have huge potential to take advantage of this element of CRO in particular. How is website persuasion used in CRO? You need to persuade your website visitors to purchase or sign up – don’t just hope they will. Compelling copywriting plays a huge part in persuasion, particularly headlines, bullet points and CTAs. Mention how your website solves pain points and benefits. My copywriting guide gives many best practices and techniques to use. Social proof, urgency, scarcity, reciprocity are essential influence techniques to use, as made famous by Robert Cialdini’s ‘Influence’ book. Social proof is particularly important to show prominently, including reviews and ratings, testimonials, ‘as featured in’ and logos of well known customers. Doing this will increase the chances of visitors thinking your website is liked by others, and also using it. What tools do you need for CRO? A web analytics tool. This tool is essential because it helps you monitor your current website conversion rate and success metric performance. It also helps you to gain great visitor insights and find poorly converting pages for improving. A simple web analytics tool like Google Analytics needs to be setup and used for this. Visitor feedback tools. Getting great feedback from your visitors is essential for really understanding their needs and for gaining high-impact ideas for improving your website and conversion rates. User testing tools like Userfeel.com and UsabilityHub.com and feedback tools like Hotjar.com are very important for this. An A/B testing tool. Ideally you need to test different versions of your content (like different call-to-action buttons or different page layout) to see which version increases your conversion rates the most. A low-cost A/B testing tool like VWO is a great place to start, and here is a review of the most common A/B testing tool choices. Is there a process I can use to get better CRO results? Step 1 is to do in-depth conversion research, this is essential and was discussed earlier in this guide. Conversion research then feeds into CRO ideation step 2 where ideas are created for improving your website, along with ideas from website persuasion and UX elements (2 of the other parts of CRO). 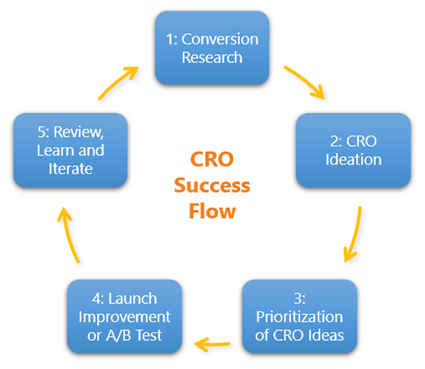 Prioritization of CRO ideas in step 3 is important to ensure you launch ideas with highest impact. Use my website prioritization tool in my CRO toolbox to help you do this. Next in step 4 you launch the website improvement or A/B test it (if you have enough traffic). The last and very important thing to do for step 5 is to review, learn and iterate from what you have launched or tested. This then feeds back into forming more conversion research, and the process continues again. Can you do CRO if you don’t have enough traffic for A/B testing? Many people think that A/B testing is an essential part of CRO. While it is very useful for discovering which versions of your website ideas convert better, it is not essential, and many websites don’t have enough traffic to do A/B testing (you need at least 5,000 unique visitors per week to the page that you want to run an A/B test on). However, if you don’t have enough traffic you should just launch your website improvement ideas and then monitor their impact on your website conversion rate. Here is a great guide that explains how to do CRO if you have a low traffic website. Do I need to A/B test all CRO improvements or just launch them? You don’t have to A/B test every CRO improvement you want to make to your website. This would require a lot of traffic, time and effort. Most importantly though, there are improvements you can just launch, even if you have enough traffic to A/B test them. These are considered best practice and will improve any website, so should just be launched without needing A/B testing first. This frees up time to A/B test other elements with higher impact. What website elements have biggest impact on CRO? Unfortunately there is no silver bullet that will work every time. Depending on your type of website, your unique value proposition and your type of visitors, there are hundreds of website elements that contribute to increased conversion rates. However, here are some things to improve that often have a big impact on increasing your conversion rates. Shopping cart and checkout pages or signup flow pages. These are key because if your visitors struggle with these pages (regardless of how good their prior experience has been on your website), then they will abandon your website, lowering conversions and potential revenue. In particular you need to make your forms simple to complete, remove non-mandatory fields, improve your error validation, and use risk-reducers like security seals, benefits of using your website, guarantees and shipping/returns offers. Your home page and key entry pages. These are often referred to as your landing pages, and usually get the most traffic on your website, so often have the biggest impact on conversion rates. Making sure these are focused, uncluttered and solve for your visitors main needs will greatly improve your conversion rates. Using targeting for your tests on these pages to customize your visitors experience will meet their needs better and increase your conversion rates too. For more details on these, and hundreds of other ideas to improve your conversion rates on many types of web pages, check out my CRO course, or check out my book. This last CRO question is a very common question, and sorry to disappoint you, there is no simple answer. This is because conversion rates are hugely dependent on your website type, your unique value proposition, and your marketing efforts. For a rough benchmark though, 2% is average for an ecommerce website and anything above 5% is considered very good. But to prove my point, it’s not unusual to have conversion rates above 50% for good, focused paid search lead generation landing pages. Also, don’t compare your conversion rate to your competitors or what you have read in a blog or a report – it’s risky because it may set you up for a fall or set incorrect expectations to your boss. It’s more important to increase your current conversion rate – never stop improving! To help you learn even more about this growing subject of conversion rate optimization, there are a number of very useful resources you should check out, from great books to great training and courses. You will find these very useful! So there we have it. The Ultimate Guide to Conversion Rate Optimization. Hopefully you found this very useful – please share this with your colleagues, and feel free to comment below. I work with small professional health practices here in Australia. Our primary conversion goal is to generate a telephone call to the practice. I have been testing call tracking phone numbers (but only for traffic which arrives via Adwords: tracking organic traffic is more difficult because the installation of a tracking number on the website sends a different Name-Address-Phone signal to Google Local, and we have the potential of losing the client’s Google Local rankings). Having reception staff keep records of incoming calls generated from a website is generally a very poor tool for measuring conversion. So my question (after two paragraphs of text!) is: can you offer any other ideas for measuring phone calls as the optimisation goal? A favourite resource of mine has to be Crazy Egg (I notice you’ve used their CTA as one of your examples!). For me the “heatmaps” that come as part of Adobe Clickmap just don’t do a good enough job and Crazy Egg wins hand down – aside to the fact that it’s an exceptionally good tool from an ROI perspective given it’s low cost. There’re some really good bullets in your “What else do you need for conversion rate optimization?” list…though I’d like to suggest another, namely “a supportive, flexible and efficient business structure”. In my opinion, the business structure has a great bearing on the ability to run a high quality optimisation programme. I’ve worked in a company at one end of the scale where the business is totally siloed – analysts are analysts, marketers are marketers, IT devs are IT devs, etc, and all of these different people feed into different areas such as marketing, IT and sometimes finance. Different areas = different targets = different priorities! Unless well managed (and there’s no guarantee this is always the case! ), this structure simply leads to a sluggish and inefficient optimisation programme whcih is controlled by a ticket system and, sometimes, peoples’ opinions rather than the facts. At the other end of the scale, I’ve had the fortune of working in a business structure whereby the optimisation programme is controlled by a single team. This team contains marketers, designers, analysts, devs, etc, all reporting into the same business area and all having the same targets. In this scenario, the expectation is that everyone will wear multiple hats and essentially become “optimisation specialists” – just because you may be an analyst doesn’t mean you won’t develop marketing, design and usability skills! Granted, this structure is in theory more difficult to sustain (what happens when one of your top all-rounders leaves? Surely it won’t be easy to replace them? ), but I believe the rewards speak for themselves, namely a fast and efficient optimisation programme. Conversion rate optimization makes so much more sense to me on a gut level than SEO. Because who cares how much traffic you have if they aren’t engaged? Sure if you get a ton of traffic you can sell ads — but it’s more likely that you want revenue from products, etc. Or that makes sense in my head anyways:P Thanks for all the tips! Fantastic article. Perhaps more the “ultimate *introduction* to CRO” and your book is the guide… haha. CRO is a thing at the moment because it’s so neglected, but I guess soon more businesses will be confirming the importance by having general “on-site marketing and UX” area, vs social/SEM/inbound as a separate discipline. Rich, great article on conversion rate optimization. My company (Abine) is currently working on improving our landing page conversion rate and I had a question for you: what becnhmark data do you use for landing page conversion rates? I am trying to gather as much information as possible so I am curious as to what you would consider a bad / good / great conversion rate? High Eric – Great question. There isn’t really much benchmark data around because it really all depends on what (or if) you are selling on your landing pages, and the quality of your traffic. Definitely over 30% conversion rate could be considered very high though, and less than 5% could be considered low. But if you are just generating leads, I would say over 30-40% is very achievable. Hope that helps! Glad that you agree Jenny! It’s all about engaging and converting your current levels of traffic before doing more SEO or social media. Great article, I’ve been struggling to effectively up my conversion rate. I suffer sometimes from allowing beautiful design to influence my decisions on my website. I worry that buttons that say buy now or similar to be pushy, but I’m fairly sure they are probably more effective. What do you suggest? Hi Alex – glad you liked the article. It really depends on what type of website you have, ‘buy now’ isn’t too bad for ecommerce sites, but if you have another type of website I would certainly add a secondary call-to-action that gets visitors to ‘learn more’ about the benefits of what you are selling or offering.